If you live in North America, Europe or far western Asia, you might be able to catch an exceedingly young lunar crescent after sunset on April 4, 2011, which is the day after new moon. All other things being equal, it’ll be hardest to spot the young moon in Asia and easiest to spot in North America. Springtime is the best time to catch a young evening crescent, because that’s when the waxing crescent moon stands most directly above the setting sun. In springtime, evening crescents stay out longer after sunset. As the razor-thin lunar crescent makes its appearance after sunset today, it’ll be less than one day after new moon for most of Asia, and less than one and one-half days old for much of the U.S. New moon fell yesterday, on April 3, at 14:32 Universal Time (10:32 a.m. Eastern Daylight Time, 9:32 a.m. Central Daylight Time, 8:32 a.m. Mountain Daylight Time, 7:32 a.m. Pacific Daylight Time). In your search for the newborn crescent, find an unobstructed western horizon – and if possible, a hilltop – and have binoculars handy. 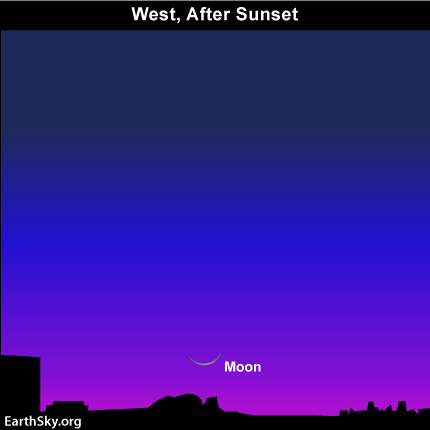 At mid-northern latitudes in the U.S., the moon sets well over one hour after sunset. In Europe, it’s closer to one hour after. Starting 30 to 45 minutes after sunset today, look above the sunset point on the horizon with binoculars and keep on looking. You just might spot the pale, whisker-thin crescent moon smiling at you in the twilight. If you miss the moon this evening, try catching an older but a more photogenic young moon basking in earthshine on Tuesday, April 5. Site contents copyright © 2019 Recorder Online	except as noted. All rights reserved. | 88 queries in 2.151 seconds.